When we were walking home from our palazzo tour on Saturday I looked up and said to Rob, "Wow, I've never noticed that before." Story of my life here in Florence. This city is so rich in beautiful architectural, artistic and design details that it seems like you are discovering something new every time you go outside. 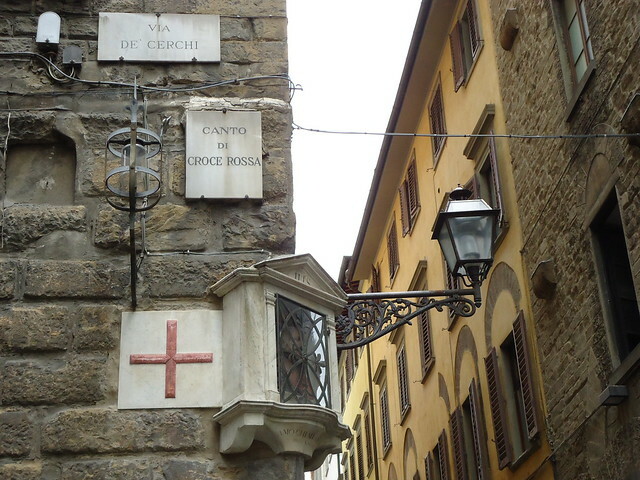 Anyway, what I noticed was a beautiful corner with the red cross, beautiful lamp posts and a sweet little devotional box (is that what they call them?). It was a crowded, but lovely little corner.